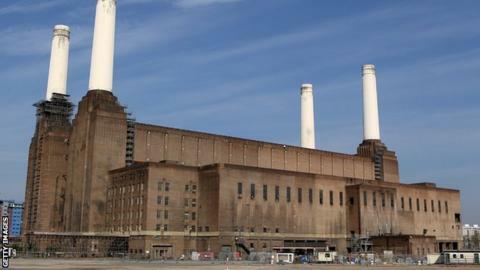 Chelsea have made a bid to buy Battersea Power Station in south-west London and plan to redevelop it into a 60,000 capacity stadium. The landmark's four chimneys would be kept as part of a design which includes a 15,000 seat single-tier south stand. Chelsea said in March expanding their current home, Stamford Bridge, made no economic sense, while a new stadium on the site faced planning problems. The club added they are not the only party interested in acquiring the site. "There is no certainty we will be successful," read a club statement. "We must also stress that making an offer for the Battersea Power Station site does not mean the club has made a definitive decision to leave Stamford Bridge." The club say the plans, which would preserve the building's Grade Two listed turbine hall and control room, would provide "a unique architectural backdrop to a world-class stadium". A development of shops, housing and offices, and a contribution to the extension of the Northern Line underground service into the area, are part of the offer. Stamford Bridge's capacity of 42,000 compares unfavourably to Arsenal's Emirates Stadium, which holds 60,000, and Manchester United's Old Trafford ground, which has seating for 76,000. Chelsea have been linked with other sites in south-west London while they are also considering ways of increasing revenue, such as selling naming rights to their current home at Stamford Bridge. The club had previously shown an interest in taking over a site in Earls Court once the Exhibition Centre had been demolished, and had been rumoured to be considering a bid for Chelsea and Westminster hospital. The possibility of Chelsea relocating from the stadium they have played at for 107 years has been complicated by a disagreement with Chelsea Pitch Owners (CPO), a fan-owned company who acquired Stamford Bridge's freehold in 1997 to protect it from developers. The club's attempt to buy the freehold back in October was rejected by CPO's shareholders, who accused it of not making enough of an effort to remain at Stamford Bridge. Tim Rolls, a CPO shareholder, said it was his preference "and the preference of a lot of Chelsea fans is to stay at Stamford Bridge". "That hasn't changed. I am still not convinced the club have exhausted every possible avenue for redeveloping our ground, I just don't believe they have," he added. "Having said that, if we do have to move then Battersea is one of only two options that would be acceptable to Chelsea fans. The other is Earls Court." Ravi Govindia, leader of Wandsworth Council, said the power station was "the biggest development opportunity in central London and a key site within the Nine Elms regeneration zone". "Any new owner will need to work within the existing planning framework for Nine Elms," he added. Battersea Power Station's owners have been trying for more than a year to find an equity investor to fund a proposed £5.5bn redevelopment. Energy stopped being generated at the station in 1983, but the site is still used for hosting events - one of the latest being the ATP World Tour Finals Gala.